« Flow Yoga? Vinyasa Yoga? Vinyasa Flow Yoga? You’ve probably seen these before. I know I have. I don’t know where, but I know that when I saw them I wanted to make them. I was having company over last weekend and I didn’t know what to make because I didn’t know who was eating what and we usually end up with so much food. I decided I would do these as an appetizer and supply the dessert and the company could bring the rest. Worked out great! 🙂 As I said I had remembered seeing these before, but didn’t bother to look them up because I thought I could figure them out. I did, but as I sat down to write this I thought I would give it a quick look-see. I should have looked before I made them because, of course, there are much better ways to present them shown on the internet. Mine were ok, and I will probably do it again, but I do like the swishy drizzle. Not that I could ever accomplish that. I tried to drizzle and the new thing from Costco that is on the balsamic vinegar, just dripped it all over the plate. I gave up and used a spoon. Anyway . . . here is a quick and yummy appetizer. 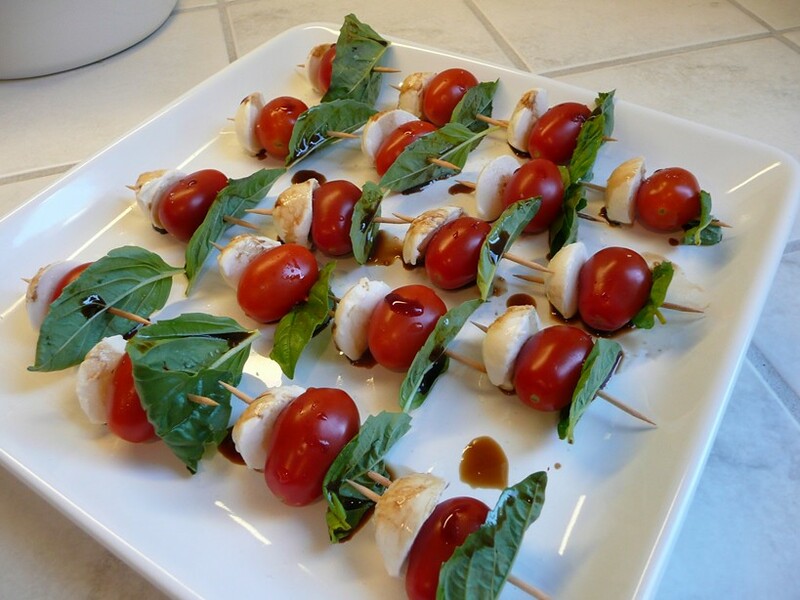 Caprese salad or as I am calling these Caprese Bites. Drain the mozzarella and let it dry out a little bit. Wash your basil if you desire, then let it dry a bit. Wash the tomatoes and let them dry. Then cut the mozzarella balls in half. Sprinkle the cheese with salt. Then decide the order. I had cheese-tomato-basil. 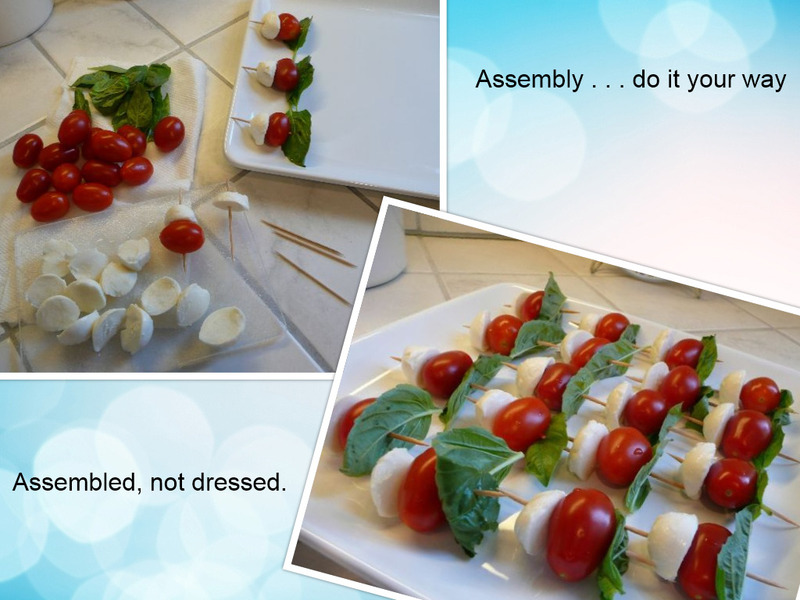 Then stick a tooth pick through the cheese, then the tomato, then a basil leaf. Drizzle with balsamic vinegar and sprinkle with a little salt. So, I made these last weekend. I didn’t take a picture. I had leftover cheese, so I made them again for this post. I salted the cheese the second time I made these. Then I salted the entire “bite” after I drizzled on the balsamic vinegar. I barely used an salt and half of it rolls off. But I really think the salt helps bring out the flavor in everything. Salt is a flavor enhancer. YUM. Also the second time, I tried to stick the tomato on one side . . . in other words NOT IN THE MIDDLE. I tried to pierce it closer to one side of the tomato so it would rest better on the plate. I did also try doing it with the tomato on the bottom and the toothpick up in the air, I didn’t like that. It probably would have worked better with the cheese on the bottom. Or if the tomatoes are cut. Either way . . . such an easier appetizer. And so yummy. I actually assembled it the night before. But I put the vinegar and salt on right before I served it. Both kind of make the cheese “melty”. So it got a little messy. But it was still good. I was actually surprised how much I liked them. I made a lot and I think I ate most of them. My hubby and I even had a few in the days that followed. Now we have more. Yay! Yum! Have you made these before? How do you assemble them? This entry was posted on July 20, 2016 at 9:49 pm	and is filed under "Recipes", Food. 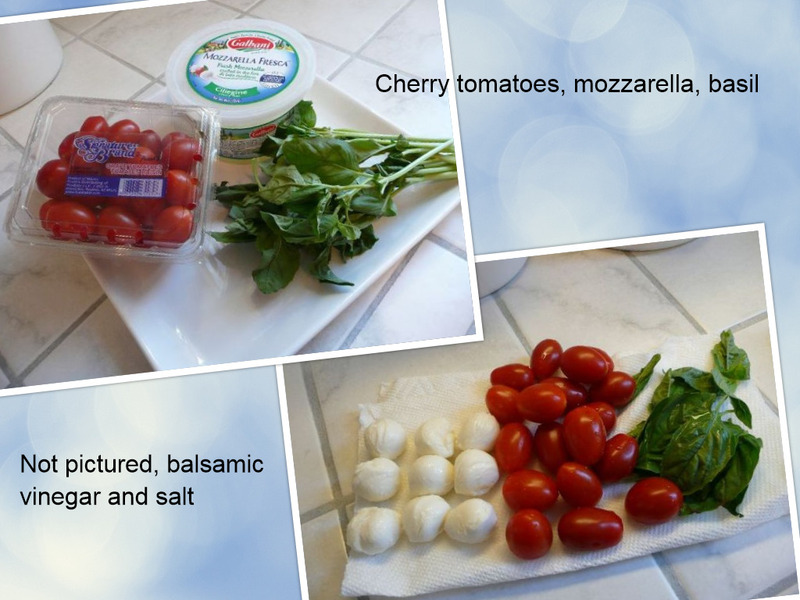 Tagged: balsamic vinegar, basil, Caprese Bites, Caprese salad, easy appetizer, gluten free appetizer, grape tomatoes, make ahead appeziter, mozzarella balls. You can follow any responses to this entry through the RSS 2.0 feed. You can leave a response, or trackback from your own site. I love those! My friend uses chunks of feta and they are oh so good. Feta would be nice because it would add that extra saltiness. I like that!